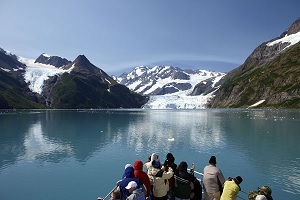 10 STEPS TO A SUCCESSFUL ALASKA CRUISE!! 1. Find the perfect ship that's right for you! .. When you are looking at booking an Alaska cruise vacation most people focus on the destination and overlook many aspects of the ship itself. Which ship you choose can affect your entire vacation. Cruise lines and individual cruise ships vary greatly in terms of atmosphere, facilities and value. Some ships cater to the adventure-oriented, nightclub/party-all-the-time ambience, some are more pampering offer a great spa, and others are ideal for curling up on deck with a good book. We suggest you work with one of our Alaska Cruise Specialists to find the right cruise for you. We'll discuss your budget, what you're looking for out of the holiday and help you decide on the perfect ship for you! There is only one way to get the best price on an Alaska cruise: book early. When you book early you'll receive the best choice of staterooms (not only stateroom type, but choice of location), you'll have the best choice of dining times (in many destinations a specific dining time is sold out quickly), and you'll receive an early booking price. If your cruise price is reduced prior to the final payment date (usually 75 days prior to sailing) our Alaska Cruise Specialist will reduce your rate so you'll pay the best rate! Some people say that it doesn't matter what your stateroom is like, since you'll only sleep there. Not so! If this is your honeymoon, a special anniversary, birthday or it's a trip on your Bucket List, you'll want every detail to be perfect. When you have a nicer stateroom you spend more time in it; sleep in a little later, order room service for breakfast, watch a DVD or relax with a book on your balcony. Don't assume anything: a king or queen-size bed and bathtubs are not in every stateroom on a ship. While some suites do have over-sized beds, most other staterooms have single beds that are pushed together for couples. Most staterooms have small (single-occupancy) showers, not bathtubs, so if you like to soak ask for a room with a bathtub. Most important, a nice stateroom makes you more inclined to enjoy things like room service and sipping morning coffee in your plush bathrobe. The ultimate luxury: a private balcony so you can leave your sliding-glass doors open and fall asleep to the sounds of the sea. A bit of preparation pays off in a carefree trip. Whether you've been busy with work, the kids or just finished planning your wedding, it's easy to forget that life will go on while you're away. Such as the mail (stop it). And bills (pay them). I suggest taping a "To Do" list to your fridge and check things off as you go. Remember while packing to include film, extra batteries, sunscreen and travel-size toiletries. You'll find these items are more expensive to buy on board the ship, and you may not find your favourite products. On most Alaska cruises, you'll want to schedule all kinds of activities on and off the ship. So will everyone else on board and usually at the same time. Shore excursions on many cruise lines can be pre-reserved, but still allow you to change your mind. Spa packages on many lines can be pre-reserved, however spa treatments are best to book the first day when you board as certain days are more popular and will book up quickly. For example, if you want to get anything done on the first day at sea, which is also the Captain's Welcome Aboard Cocktail Party and Dinner, you'll find appointments are booked up quickly. It's also a good idea to make your specialty restaurant reservations on the first day of your5 Alaska cruise so you don't lose out. Some shore excursions are worth taking and others not so much. How do you know the difference? Just looking at the shore excursion guide you'll find activities that interest you. Stick to tours that offer something different! Take a helicopter flight over a glacier, scuba dive at night, go white water rafting or take a spectacular scenic train trip. A car and driver can be a more personal (and less costly) way to sight-see than on a motor coach. To make it more fun (and affordable), put a group together with some new friends you've met on board. Just make sure you're back to ship at least an hour before sailing... you don't want to miss the boat! Ask our Alaska Cruise Specialists which ships offer their passengers more on board. Some ships and certain staterooms or suites include extras like terry cloth bathrobes, fruit baskets, complimentary champagne, etc. Our Alaska Cruise Specialists will make sure the ship is aware of your special occasion and we'll include a special Bon Voyage gift just for you! In addition, ask about honeymoon and anniversary packages that include special extras like a formal portrait in an engraved frame, a champagne breakfast in bed or side-by-side massages. The last night of your Alaska cruise is a bittersweet time. You've had fun. You're going home. And then there's that little business of tipping to take care of. Many cruise lines now have an automatic gratuity charged to your shipboard account each day. This is great because it means you don't have to sit in your stateroom and decide how much to leave, which people to leave it for and whether you have enough small bills. The amount is deducted off your credit card, or however else you decide to payoff your stateroom account. Plus, if you feel the service wasn't up to par just contact the purser's desk and they'll adjust the amount for you. On most Alaska cruises, you'll be assigned a dinner table (usually with other passengers) and time (6pm or 8pm) for the entire trip. If you prefer to dine alone our Alaska Cruise Specialists will arrange this for you. We recommend you take one night to dine in the specialty restaurant(s) on board. These restaurants usually offer a 5+ course meal that far exceeds that of most restaurants on land and that takes approximately 3 hours. After dinner take a dip in the hot tubs (since they never close) and you'll probably find yourselves alone under the stars. For more alone time, stay on the ship when everyone else goes ashore.